One could never accuse Brian Boitano of resting on his laurels. In the 25 years since he won gold at the 1988 Calgary Olympics, he has become popular with a whole new generation of fans – for his cooking. Recently, Boitano made an appearance for a book signing at the Barnes & Noble at 18th Street in New York City. 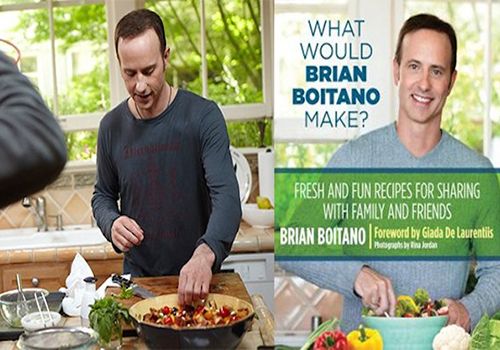 The Olympic champion signed copies of his first cookbook, What Would Brian Boitano Make? : Fresh and Fun Recipes for Sharing with Family and Friends. Filled with recipes for effortless entertaining, the book is ideal for anyone with an active lifestyle who likes to share healthy meals with family and friends. 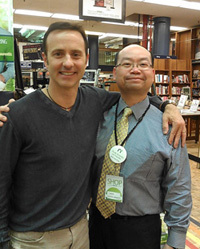 Olympic great Brian Boitano with Barnes & Noble Bookstore Manager Jason Chan. Known for his humble demeanor and great sense of humor, Boitano charmed the fans who came to meet him and pick up an autographed copy of his book. Boitano, known for winning “The Battle of the Brians,” at the 1988 Calgary Olympics, has become popular with younger fans thanks to the South Park song, “What Would Brian Boitano Do?” – which inspired the name of his popular cooking show on the Food Network and The Cooking Channel – and now the title of his new cookbook. In his latest professional venture, Boitano traded in his ice skates for chef’s knives to convey his love of cooking. According to his publisher, Boitano has traveled the world over for skating competitions, and has always been fascinated with other cultures and their cuisines. Now, he finds the same deep fulfillment in cooking and entertaining that he once found in skating. His adventures abroad influence his cooking style, as does his Italian heritage, which ensures that great food is always an important part of any gathering. Some of Boitano’s favorite food memories revolve around family get-togethers, and his cookbook includes personal stories and dishes influenced by cherished family recipes. For more information on Brian Boitano, visit his website at www.brianboitano.com.